Feel like you’ve lost your teammate? You want your marriage back…that spark, your best friend, your teammate in life. At the beginning of your marriage, you wanted to spend every minute together. Where did that go? There are careers and kids and all of life’s stresses that haven’t left time to just be a couple or focus on your marriage anymore. You don’t have any energy left to put toward the relationship, but something has to change. You feel discouraged, angry, scared, hopeless…like it will never be the way it used to be, and sometimes you question whether it was ever meant to be at all. We understand what it’s like to feel like you lost everything you once had. We work with couples who have these problems and tell us over and over their relationship isn’t what it used to be and they don’t know why. You’re not alone. According to the Gottman Institute’s research, the average couple waits 6 years before getting professional help from a marriage counselor. Six years is a long time to be stressed about your marriage! When you do get help from a professional couples counselor, marriage counseling works. According to research done by the American Association of Marriage and Family Therapists, after working with a couples counselor, 93 percent of clients said they had more effective tools for dealing with relationship problems. Some people are interested in couples therapy to proactively strengthen their partnership. Others come to couples counseling because they’re having issues in their relationship. Couples counseling is also helpful if one partner is dealing with an issue that’s affecting your marriage (like depression) or you’re just feeling stuck in your relationship. We know making the decision to go to marriage counseling can be a difficult one. But if your relationship is rocky, getting help is much more effective than hoping the issues will resolve themselves. 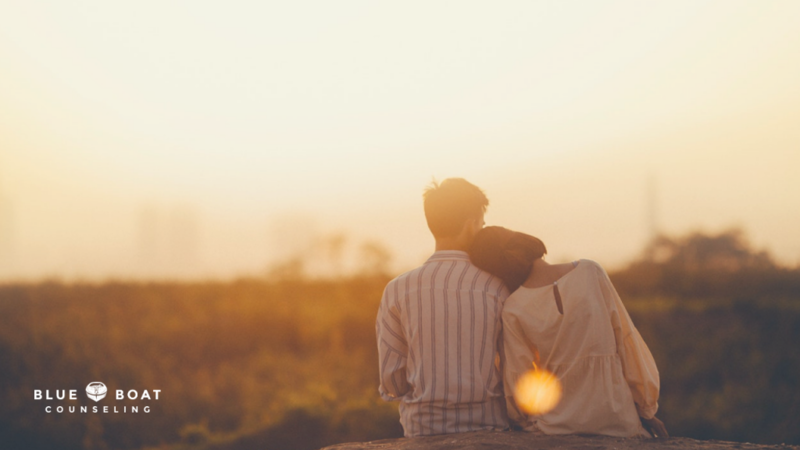 Taking that first step to admit your marriage needs guidance can be the toughest part, but most find the counseling experience to be validating and insightful once they get started. What happens in couples counseling sessions? Couples counseling is all about communication and finding a way for each partner to get their needs met. In our sessions we’ll talk through individual needs and hopes and how those impact your relationship. At Blue Boat Counseling, we’re trained in techniques to help you learn how to more efficiently process the ongoing bumps in a relationship. We’ll discuss problem-solving, open communication and how to talk through your differences rationally. We’ll consider the good and the bad parts of your relationship while we uncover the sources of your conflicts. You’ll learn together how to recognize issues and see them through a lens of improvement, without blame. We know there are things keeping you from starting couples counseling. I think we need couples counseling, but my partner won’t come with me. This is a pretty common scenario in couples counseling. 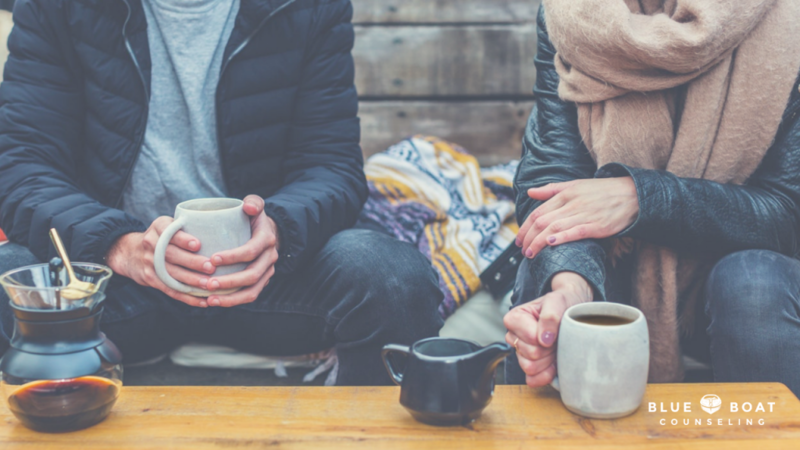 The way you bring up the idea with your partner can make a difference in their willingness to give marriage counseling a try. 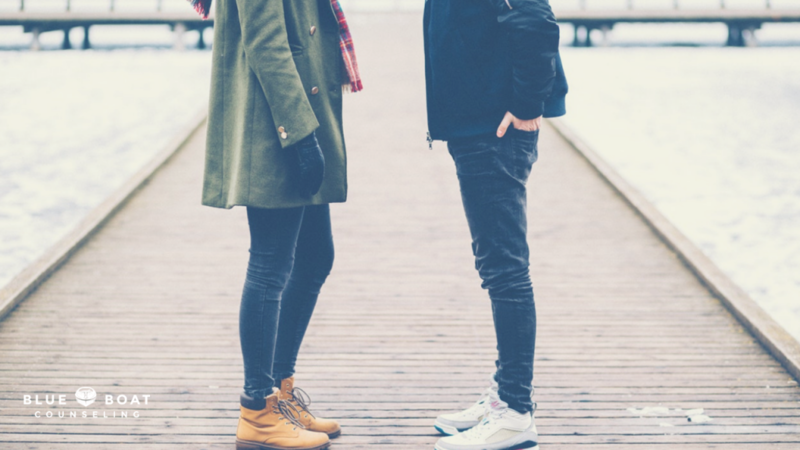 Here are a few tips for talking to your spouse about marriage counseling – don’t spring it on them; give them a little time to think it over. And don’t insist they go to marriage counseling with you immediately. If possible you want to come to couples counseling as a team, ready to work on your relationship. And allowing your partner to come to the decision to go on their own will increase the chances of that happening. If they still refuse to come to couples therapy with you, you can still attend. It is a bigger challenge to work on a relationship this way, but there are definite benefits for you to learn more about your own behavior and reactions that can improve the dynamic of your relationship. My partner and I aren’t married. Can couples counseling help us? The short answer is Yes! Absolutely! While we do a lot of marriage counseling, you don’t need to be married to benefit. Couples counseling can help with any relationship! We will help you and your partner learn to communicate better, reconnect and improve your relationship. Whether you’re dating, married or however else you define yourselves – counseling can help. We know couples, especially those with careers and kids, lead busy lives. But if you’re experiencing the types of marital issues that only seem like they’re getting worse and creating more resentment, carving out a few hours to deal with them now might actually save you time and a lot of heartache in the end. It’s about prioritizing your relationship and your healing as a couple above something else on your to-do list. Really think about where you and your partner can find an hour in your week to take care of your marriage. I’ve heard couples counseling is really expensive. We understand that committing to marriage counseling is an investment, and we don’t take that lightly. But it’s also a place to experience healing in your relationship and getting your life back. And we think that’s worth the investment. Blue Boat Counseling has had success helping other couples in the Columbus, OH area repair their relationship and would love to help you and your partner as well. We encourage you to take a good look at your family budget as well as discuss payment options, like using HSA or FSA cards, with your couples counselor. At Blue Boat Counseling, we promise to get all the baggage out on the table so it can be addressed. We’ll unpack it together until we find the answers you need to move forward. You’ll feel like we left no stone unturned in figuring out the issues in your relationship. As a Columbus, OH counseling practice with trained couples therapists, we can help you communicate again, so you’ll walk away knowing you exhausted every avenue to get the spark back. Get connected with a couples counselor you can trust. Start finding the answers you need. As a Columbus, Ohio based counseling practice, our caring therapists also offer teen counseling and family therapy, PTSD, depression and anxiety treatment. We also offer tips for improving your overall mental health on our blog. Contact us to schedule an appointment today!